Heavy rains & runoff, then what? North Carolina has experienced a wet first half of the year with some areas experiencing record breaking rainfall. While some rain may be good for gardeners and farmers, too much of it coming early in the year can cause problems for our estuaries. That’s exactly what researchers are forecasting this year for the Gulf of Mexico as heavy spring rains over the 1,245,000 square mile Mississippi watershed transports pollution to the gulf, contributing to dead zones. Louisiana Universities 2013 Gulf Dead Zone prediction. Dead or hypoxic zones are areas where factors, including excess nutrients, lead to excess algal growth which lowers oxygen levels to the point that living organisms have difficulty surviving. Since 1995, the Gulf dead zone has averaged 5,960 square miles. State and federal and governments in the watershed set a goal to reduce the Gulf hypoxic zone to an average of 1,950 square miles by 2015. High flows in the Mississippi this spring, however, have led researchers to predict that the Gulf dead zone will be large. 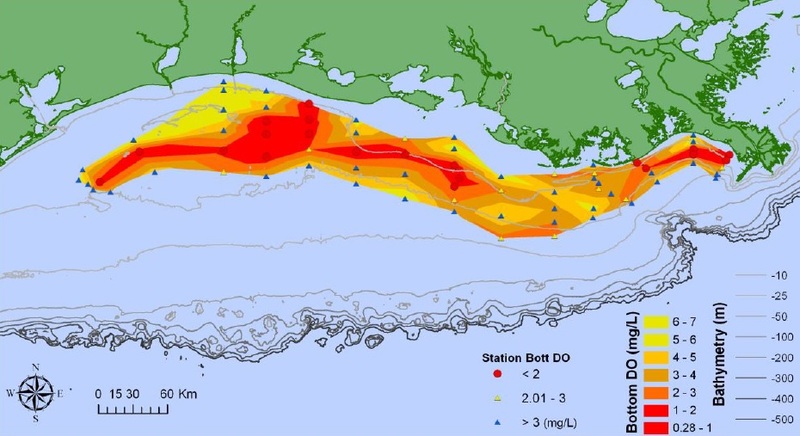 The Louisiana Universities predict that this year’s dead zone will cover 8,561 mi2. If this were to pass, it would be the largest dead zone recorded since monitoring began. What’s this have to do North Carolina? Our recent heavy rains have resulted in similar conditions where heavy runoff is making its way toward the estuaries. While researchers haven’t published predictions on the impact of that runoff on NC estuaries, the setup for our State compares with that of the Gulf. That is, the Neuse and Tar-Pamlico’s estuaries will face a higher threat this year of hypoxic conditions from heavy rains and polluted runoff. Continued heavy rains, however, may help flush much of these pollutants out into the ocean. As we enter the hot, sunny summer, we should find out soon about the impact of these rains on our estuaries.